Howard Jolliff played only two years of varsity basketball at Ohio University, but he left an indelible imprint in the OU record books. 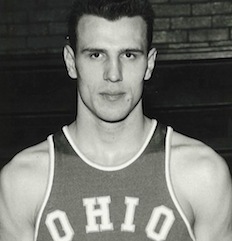 Jolliff, who had broken rebounding records while starring at Canton South High School, was an outstanding scorer and rebounder for the Ohio University Bobcats. He averaged 13.7 rebounds as a sophomore. As a junior, he averaged 16 points and 18.7 rebounds as OU won its first Mid-American Conference championship. He averaged 21.3 rebounds in three NCAA Tournament games and scored 29 points when the Bobcats defeated Notre Dame in a first-round game. He grabbed 26 rebounds in a loss to Georgia Tech and was named to the All-Mideast Regional team. After his junior year he was drafted by the Los Angeles Lakers and became the first Bobcat to play in the National Basketball Association. A knee injury ended his pro career in the third season. Jolliff coached basketball and golf two years each at Ravenna and Massillon Jackson high schools. His Ravenna golf team won the 1966 state championship. He spent 25 years as a principal in the Canton South School District. He and his wife have two children.